Club World Casinos Exclusive Video Slot Review - Casino Answers! Club World Casinos is a 5-reel, 25-line video slot developed by Realtime Gaming, featuring three wild symbols, scatter wins, multipliers, a free spins feature, a re-spin feature, bonus game and a progressive jackpot. You can play the Club World Casinos exclusive video slot at Club World Casinos and Lucky Red Casino. 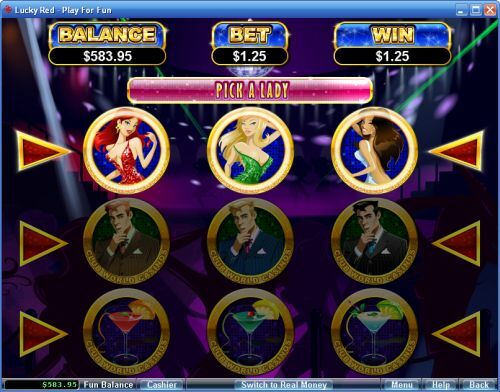 The Club World Casinos game is a penny slot. Bets on the Club World Casinos slot machine are $0.01, $0.02, $0.03, $0.04, $0.05, $0.06, $0.07, $0.08, $0.09, $0.10, $0.25, $0.50, $1, $2.50 and $5 per line. You can select up to 25 paylines on the Club World Casinos online slot. You can bet anywhere from a penny per spin up to the maximum total bet of $125 per spin. The Club World Casinos casino game has a good betting range that will be suitable for most online slots players. You can skill stop the reels on Club World Casinos Slots by pressing the “Stop” button in the middle of any spin. To spin the reels on the Club World Casinos exclusive slot game, select your bet and press the “Spin” button. The top-paying symbol on the Club World Casinos online slot is the Club World Casinos Logo. If you land 5 of a Kind, you can win 5000 coins. When coupled with one of the lovely lady symbols, you can double your winnings up to 10,000 coins. Other high-paying symbols include the Bridge (1250 coins) and Bachelor (1000 coins). These payouts can also be doubled when a wild multiplier appears in a winning combination. The three Lady symbols (Redhead, Blonde and Brunette) will appear on reels 2, 3 and 4 only and will substitute for all symbols other than the Scattered VIP Logo symbol. When the Ladies appear in a winning combination, the prize will be doubled. These wild multiplier symbols are very much desired and can lead to you increasing your winnings dramatically! When two or more Scattered VIP Logo symbols appear anywhere on the reels, you can win up to 100X your total bet. Also, if two or more scatter symbols appear on the reels, payouts will be made and then the reels with a scatter symbols will be held while the remaining reels will re-spin one time. Scatter wins will be awarded again after the re-spin. If 5 VIP Logo scatter symbols appear, all reels will be re-spun to the triggering position for an extra payout. Use the re-spin feature to get some extra wins when you play the Club World Casinos video slot at Club World Casinos and Lucky Red Casino. The Club World Casinos video slot has a progressive jackpot that is currently at $4,220.50. You can win the Club World Casinos Progressive Jackpot on any spin you make on the Club World Casinos slot machine. The randomly triggered jackpot can be won even on losing spins. Progressive Jackpot wins are added to other wins. Random Jackpot contribution is no more than 1.5% of total Return to Player. Wins on different paylines are added. Scatter wins are added to payline wins. Scatter wins are multiplied by the total bet. Payline wins are multiplied by the bet per line. Highest win only on each selected payline. Maximum win per paid spin is 50,000X bet per line. The Club World Casinos slot machine has an advanced autoplay mode. Hit the “Autoplay” button to open the autoplay settings. You will be able to set the number of spins, set it to stop when the jackpot is won, stop if a win exceeds or equals (any amount you input), stop on any win, stop if your balance increases/decreases by any amount you input and stop once the feature is triggered. You can stop the Club World Casinos autoplay mode using the “Stop Auto” button to deactivate it. 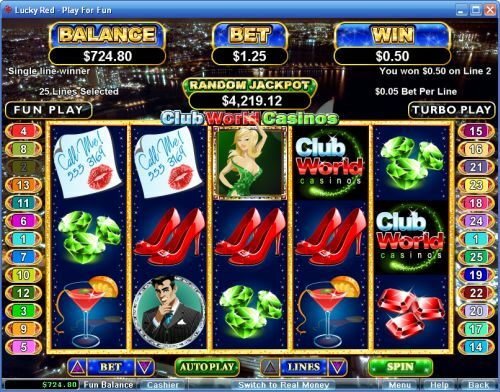 The Club World Casinos video slot has three hot wild multipliers and two amazing special features. Not only is there a re-spin feature, but also a bonus game where you can win up to 125 free spins with up to an 8X multiplier! The payouts are also great, along with the progressive jackpot. You can only find the Club World Casinos video slot at casinos in the Club World Group, such as Club World Casinos and Lucky Red Casino! Where can players from the USA play the Club World Casinos video slot for real money? Players from the United States are welcome to play the Club World Casinos slot game for real money at Club World Casinos and Lucky Red Casino. Where can I read more about Lucky Red Casino? If you want to learn more about Lucky Red Casino where you can play the Club World Casinos online slot, we recommend that you read our extremely in-depth Lucky Red Casino Review.